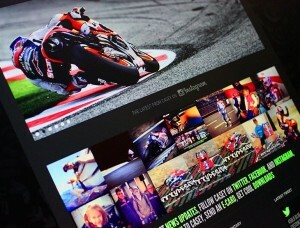 Do MotoGP, World SBK and other competition riders really need a website in this day and age? It’s a valid question. Websites aren’t necessarily cheap – and if they are cheap then they’re usually rubbish – and they also need ongoing love and attention after they’re launched. On top of that everybody’s on Facebook and Twitter aren’t they? Why on earth would a rider want a website? Well, strangely enough the argument for having a website, whether you’re a rider with a massively high profile or an up and coming racer – on 2 or 4 wheels, is remarkably strong. Perhaps stronger than ever. I’ll start – and this is directed more at up and coming riders, who may feel the effects of budget constraints more strongly than those higher up in their sport – by saying that if you’re going to have a website you might as well do it properly. It’s a truism that you get what you pay for in this life – and those free web packages will probably not serve you well if you take yourself seriously – they may sound attractive on the face of it, but you get locked into particular closed systems of shaping and maintaining a website – and it’s something that can be quite difficult to move on from, should you eventually decide you need something more professional. I know as I’ve done a couple of ‘rescue’ jobs from such sites. Not fun, believe me! Firstly – and to me, quite crucially – branding. The rider’s branding and that of his or her sponsors. Your ‘brand’ – without getting too pretentious about it – is essentially the extension and presentation of your personality, attributes, and attitude. 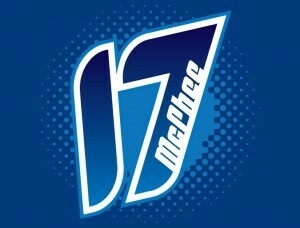 It’s the kind of thing that can be reflected and express in a rider’s logo and number design – and especially a mascot. These things bring another dimension to conveying your humour, or your racing style, or your national pride for example. 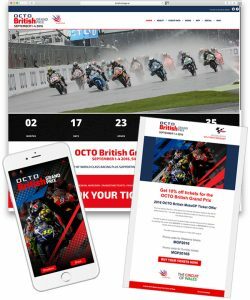 Take Scott Redding – who’s always been a rider with bags of personality – his Union flag based livery and bulldog mascot are the perfect match for the rider that fans know and love, and who they get to meet – and who they get to see on various social media platforms, where that personality extends really effectively. A logo design and number design should of course be as recognisable as possible – they should be used as widely and consistently as possible – and where one can control the way they’re presented (such as the rider’s own website) they can be shown off really well, and built into a landscape of fonts and colours and styles that work sympathetically and effectively with them. And it’s not only the rider brand that’s important. Sponsors and suppliers investing in that rider – helping with money or products and services – really deserve and should expect to have their brands shown off properly, professionally and effectively too. A strap of logos across the bottom of the homepage… A Sponsors page with their logos linked to their websites… these are good ways to ensure that the rider is clearly giving something back to them. You can give brands a shoutout on social media – but that is always going to be fleeting, whereas a permanent presence of their logo and links presented cleanly and professionally shows that their rider takes them and their contributions seriously. A website however allows a rider to own and maintain the archive of content that is specifically about them. News items, photo galleries, videos, career stats – all kinds of things. And it allows them to present it in an easily accessible way. Ask someone to find a photo of you in such and such a race on Twitter, the chances are they’re not going to find it very easily. Ask them to do it on a well structured and well presented website and it’s a doddle. We live in an online age not only of Sociability – but also Searchability. Finally a rider – and their management – should think of a website as being a “hub” – a destination in itself. It’s not something that is about doing without or neglecting social media channels (in fact I always ensure that social linking and the integration of social feeds into a website is something I recommend as a fundamental feature in a web build) but about being something that ties in with social channels, and which does things that no other single or isolated web platform can do. A rider can make their website the home of their branding, the best showing-off of their sponsors’ brands, the place where people can go to find out *all* the information, to browse or to search, to watch videos… maybe even to sign a guestbook, send E-Cards, or download a cool phone wallpaper with their logo on it. But it’s where all these things can live in one place – including social streams. And you only need to point people to one URL. And ideally a URL at this as simple as being the rider name dot com. 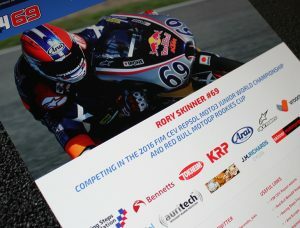 A well-scoped website can effectively promote merchandise sold elsewhere – or of course host its own online shop – and in the case of Danny Kent for example it can also host the rider’s Official Fanclub, where users can sign-up via an online payment system, and then have access to a restricted and private members’ area which contains special competitions and offers unavailable to non-members. A rider can get their website to link out to other channels, and can get those channels to point back to the website. But that website is something that the rider can “own” in so many senses… They can control every aspect of it, and can not only use it to showcase existing sponsors but also to help attract new sponsors. Sponsors love people who present themselves well, and who can be trusted to take these things seriously and professionally. A website is just one part of what is basically a big web/online ecosystem… Different parts of it do different things and do them well. But it’s a crucial part – I believe it’s still the cornerstone of a correct approach to a broad online presence. A good website isn’t just a single part of that ecosystem, but a whole unifying part of it: one that helps join many of the other parts together and which a rider can control and shape in a way that is entirely about them and which can grow with them through their racing career – and beyond. Take it seriously and it will serve you well for as long as you need it. If you’re a rider whose website is underperforming – or a manager whose star deserves something better – then email us at info@vroom.media or drop us a line via our Contact Form.